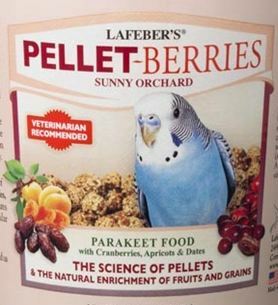 Lafeber’s Pellet-Berries are an exciting result of combining the science of pellets with the natural enrichment of fruits and grains. We have combined our pellets with tasty tidbits of cranberries, dates, apricots and grains in a round berry shape to create a delicious wholesome meal that promotes healthy foraging. Pellet-Berries are a step above most pelleted diets because they are nutritious, delicious and fun for your parakeets, cockatiels and parrots.